Starting from Oct 6th 2017, PTC41 meter will be discontinued. Looking for a possible substitute, please check out the PTC-13 Series and DPF20 for details. 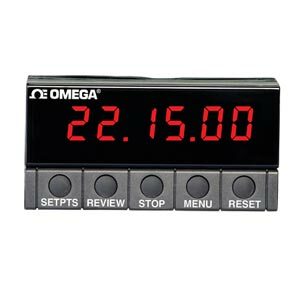 The PTC41 multifunctional panel meter is designed to be set up as a clock/timer controller or stopwatch. The unit contains eight different time bases and has a built-in date function. The meter employs five controller output modes, which enables the user to set up the unit to virtually any timer control application. The PTC41 is perfectly suited for life cycle testing, turning four loads on and off based on timing cycle. The clock time base is derived from the 50 or 60 Hz power line and from the internal crystal oscillator. Front-panel pushbuttons provide a convenient means of configuration and access to the meter’s many features. These features can also be accessed through RS-232 or RS-485 serial communications. The front-panel displays values and messages with six, 14-segment LED’s. 참고: * DP40-S2 and DP40-S4 options are mutually exclusive; only one can be installed in a unit.